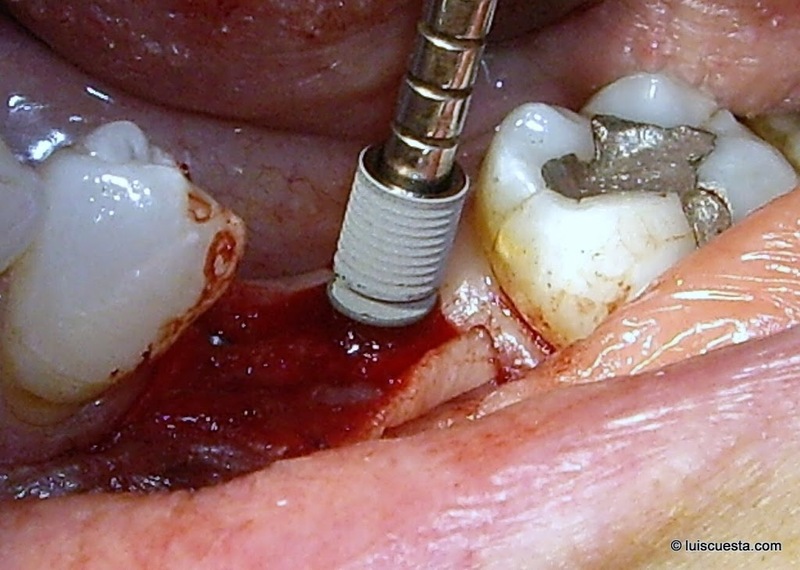 At the beginning of the dental implants era, we thought that just placing the dental implant on a prosthetically convenient place and achieving a proper osseointegration was already a success. 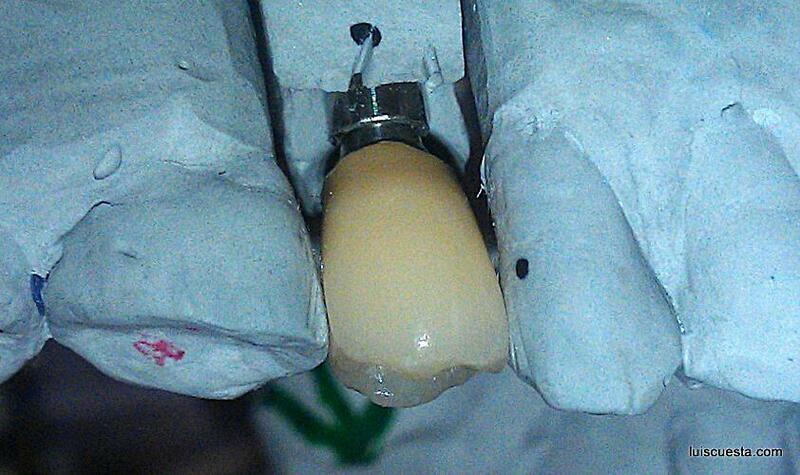 Today the success criteriahave been raised in the dental implantology, based on the continuous research. 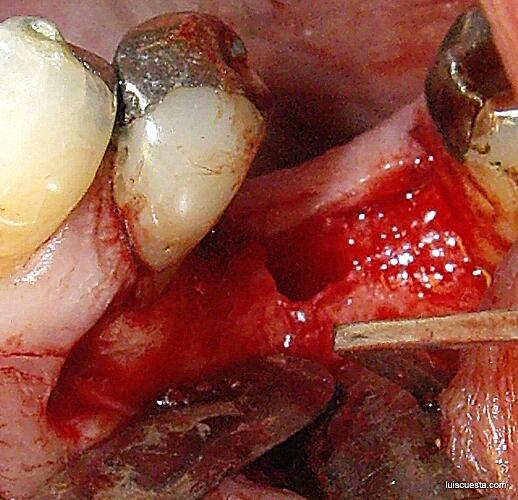 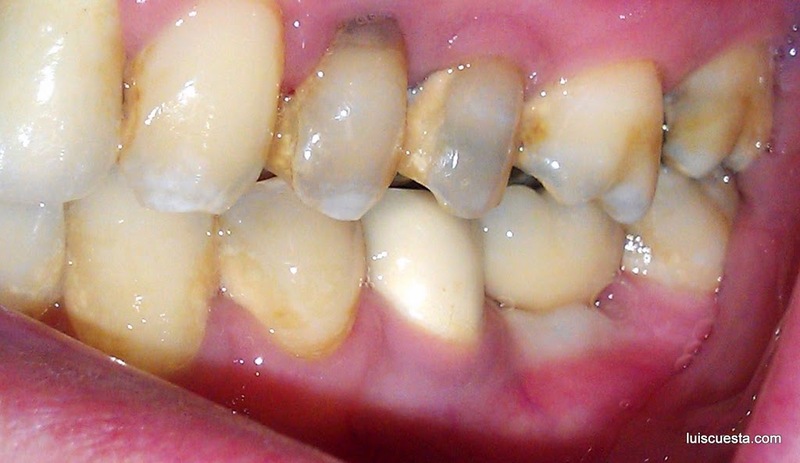 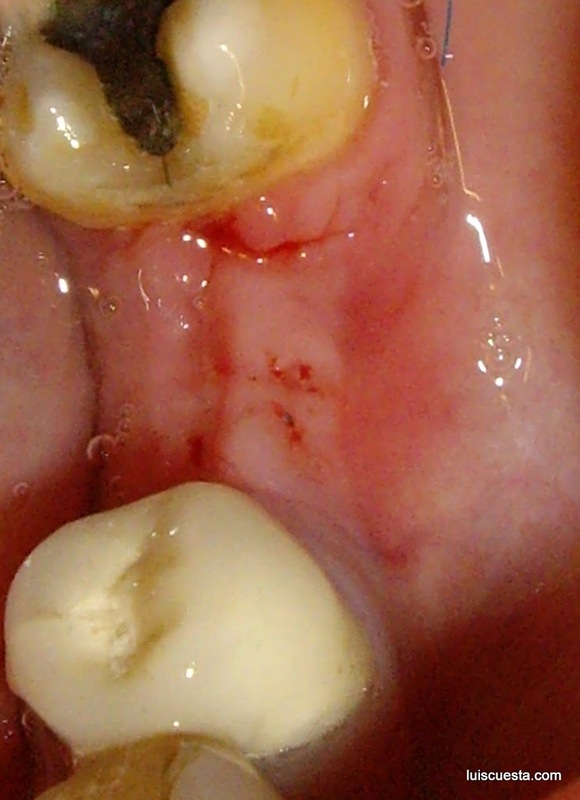 This is because the dental implanthas no micro blood vessels around it like a tooth has. 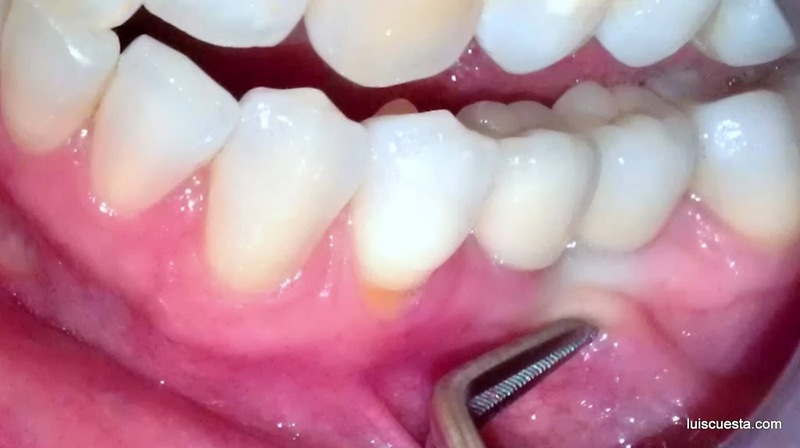 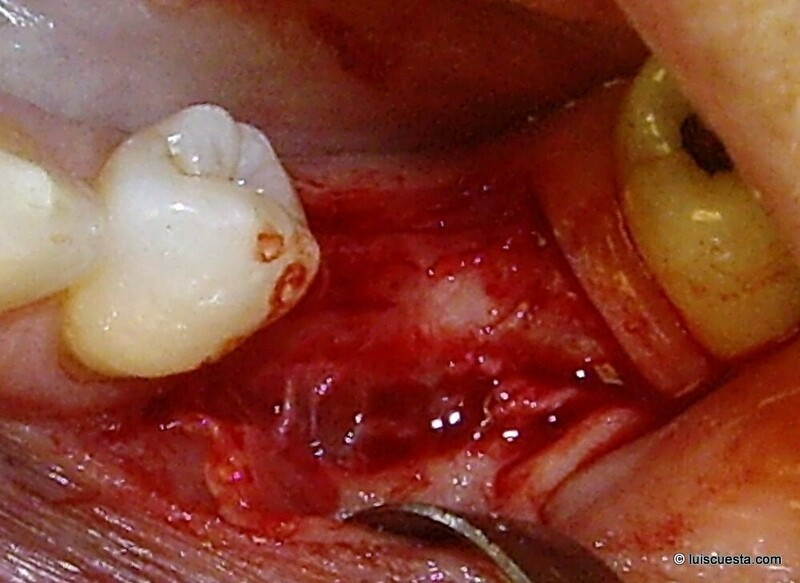 The blood support for the bone around a dental implantneeds, therefore, to come extra from the soft gingival tissue, since the internal bony circulation is quite limited. The free gingiva is made of non keratinized tissue. 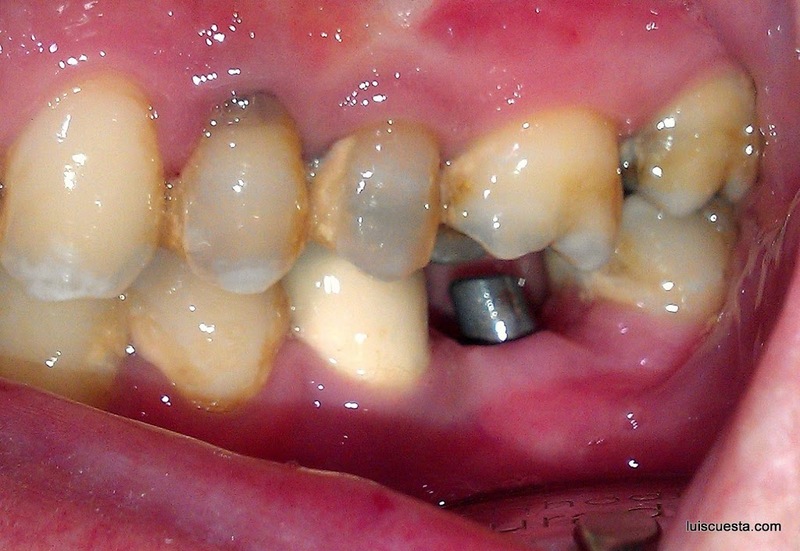 It surrounds the neck of teeth and implants and its inner side forms the gingival sulcus. 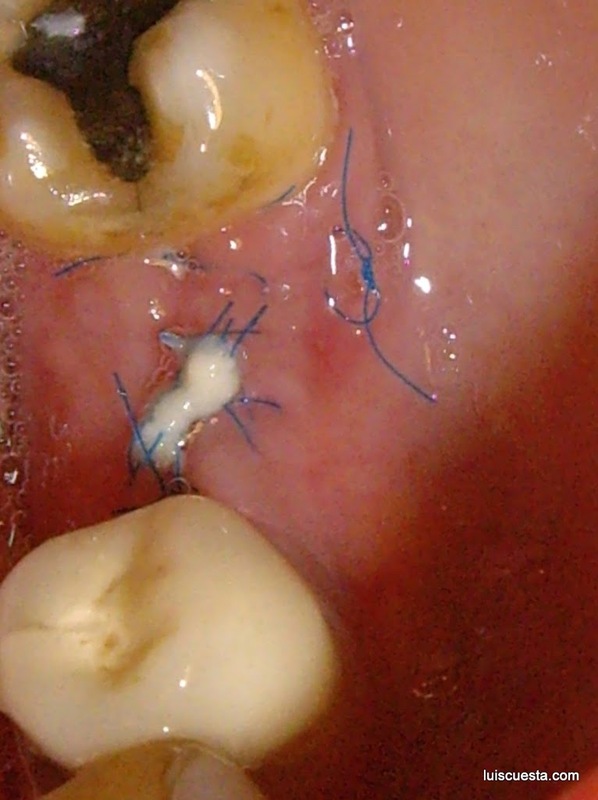 The attached gingival tissue is made of keratinized fibers and it is associated to masticatory function. It lays between the alveolar mucosa and the gingival groove. It has a characteristic orange-peel stipplings in a healthy state. 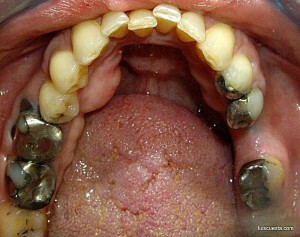 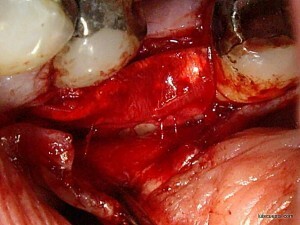 The alveolar mucosa is the non keratinized continuation of the attached gingiva towards the cheeks and lips. 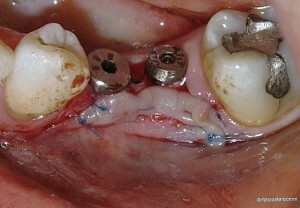 It is movable, too. Between this two there is a characteristic line, limiting what is attached and what is movable. 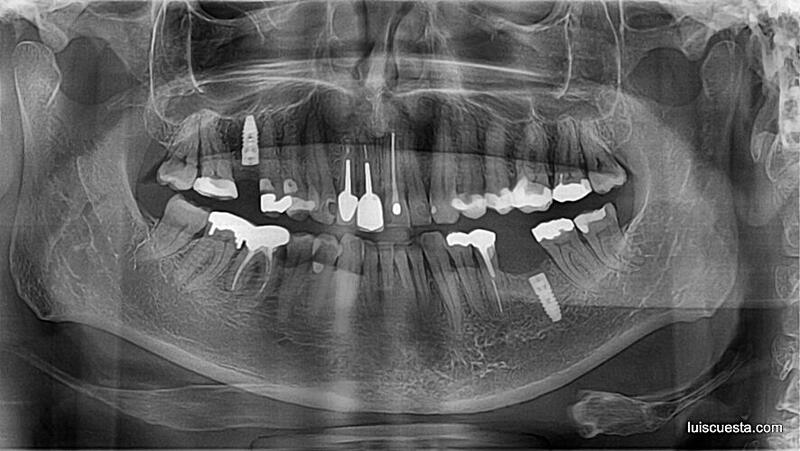 In this clinical case we see how two dental implants are placed on the left lower jaw, after a long term period without teeth. 50 year-old woman, non smoker, thick biotype. 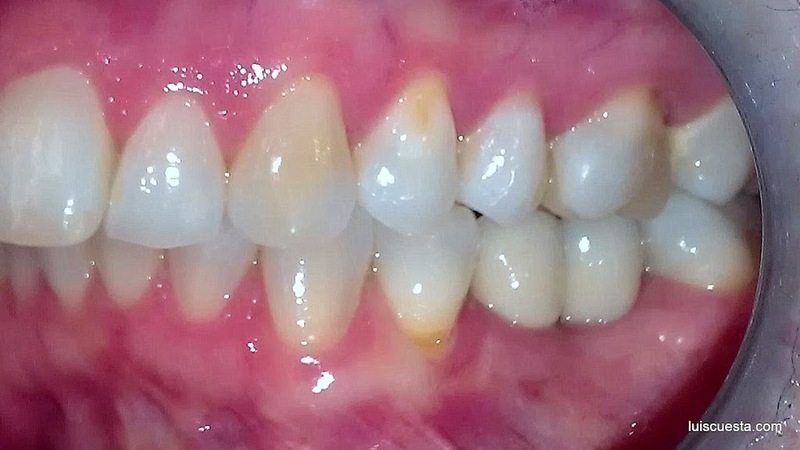 By clinical examination we appreciate light vertical bone resorption, mid horizontal resorption -thanks to the thick biotype pattern- but indeed a remarkable recession of the attached gingiva. 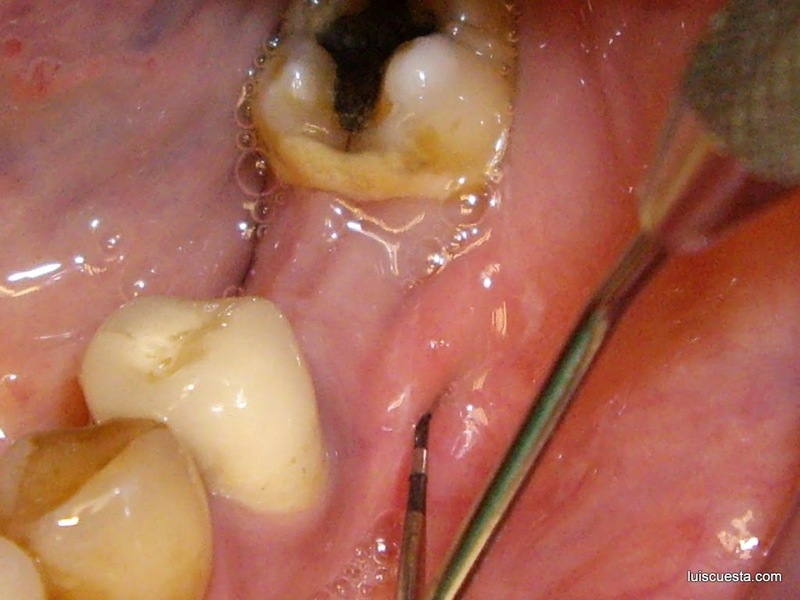 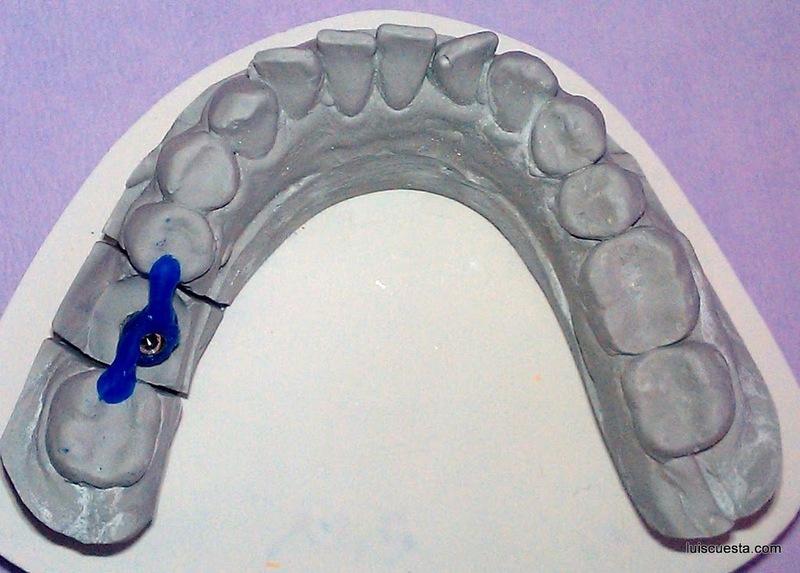 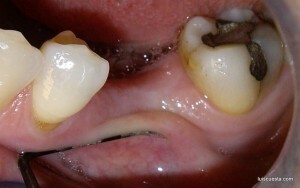 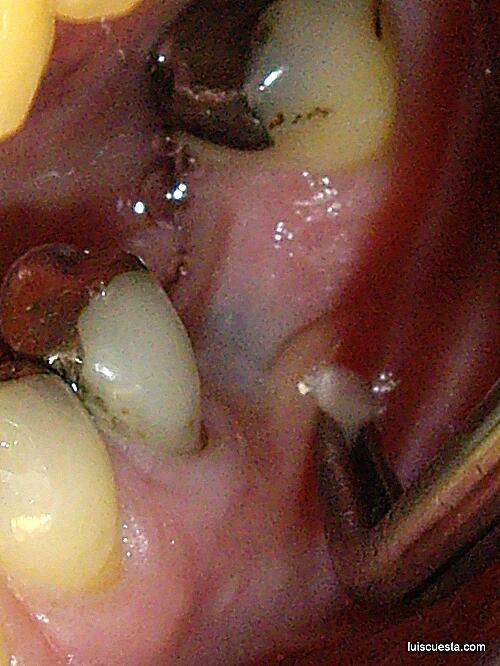 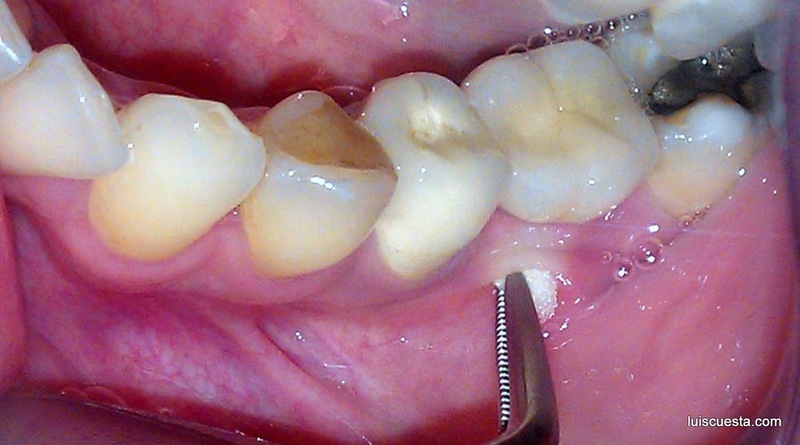 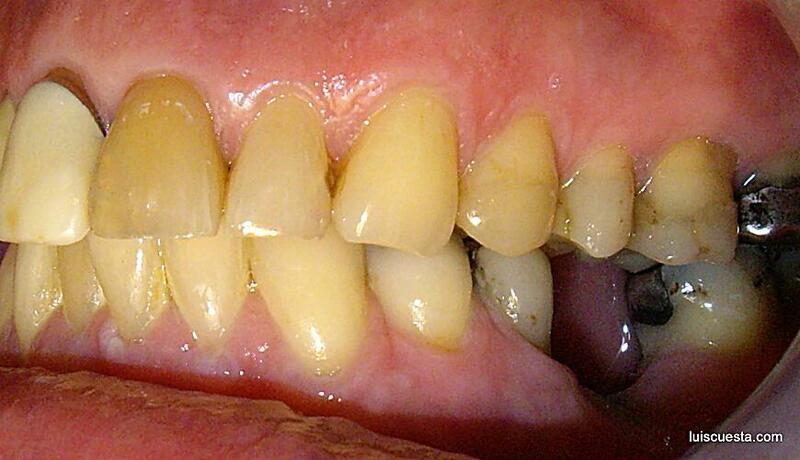 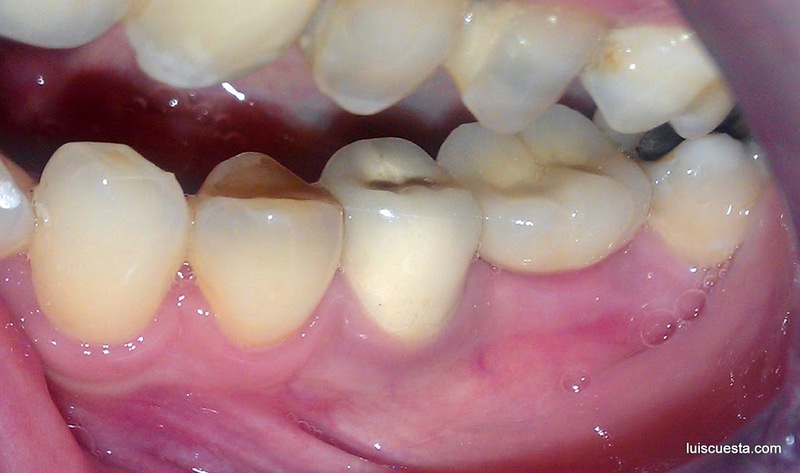 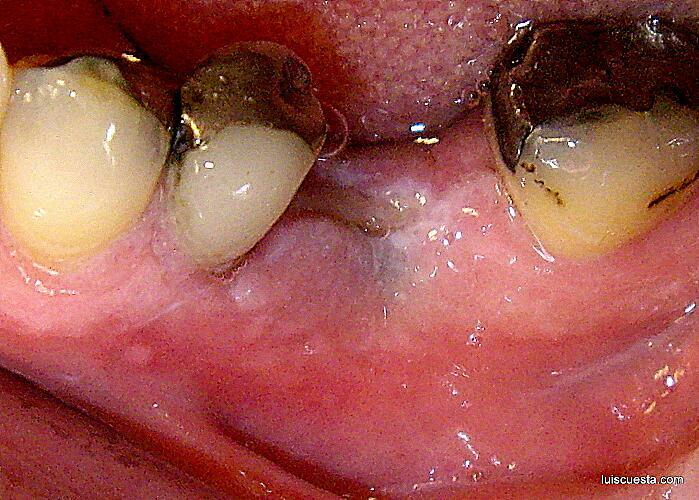 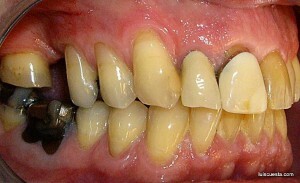 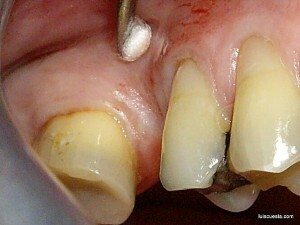 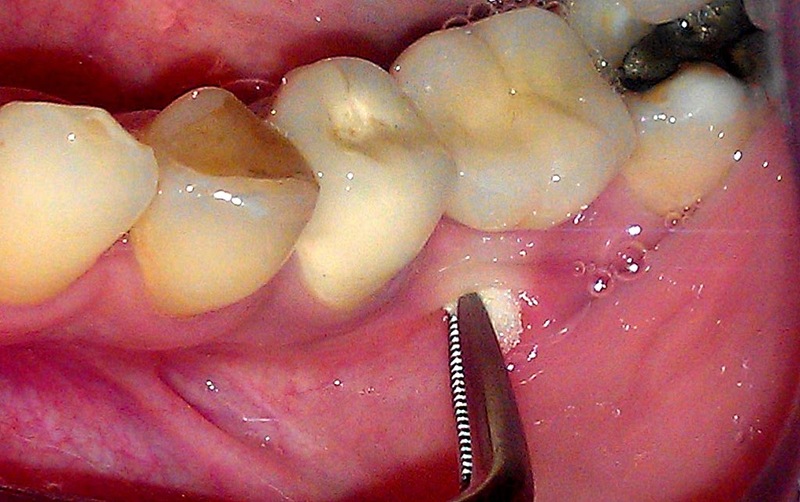 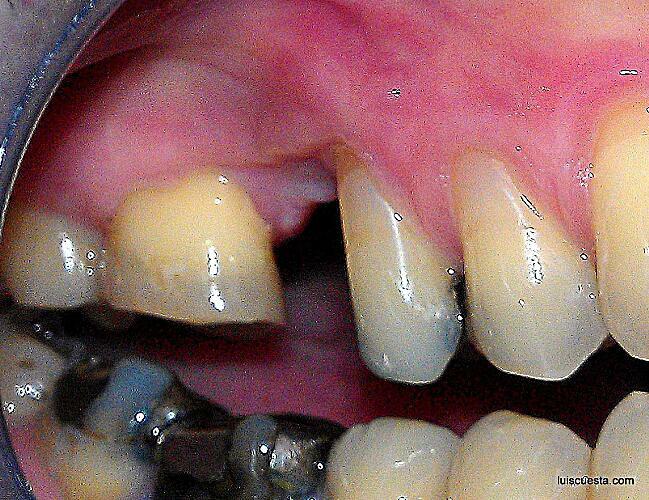 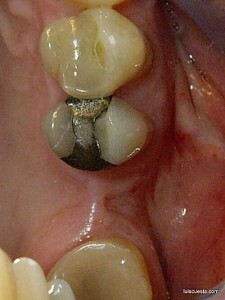 The mesio-distal gap between adjacent teeth is 23mm. The 5″ diameter measurement balls show panoramic 2D X-ray show enough bone depth for two 12,5″ ICX-Templant implants on both sides. 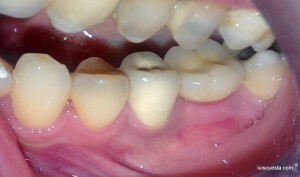 We will discuss the left side on this post only. 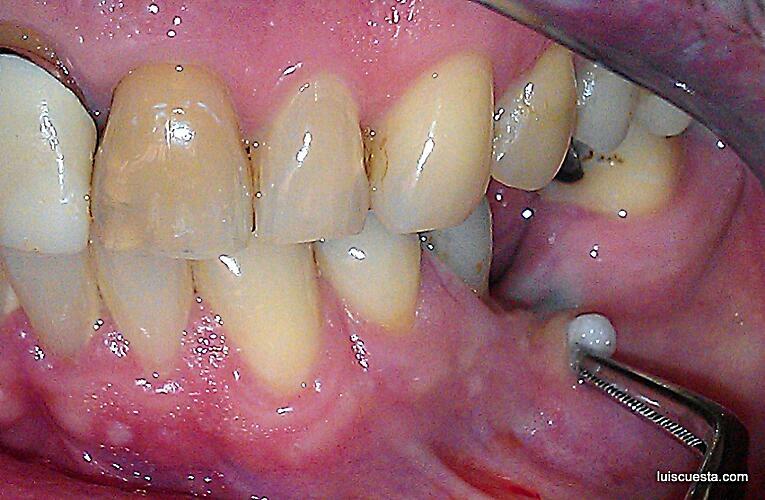 The purpose of this surgery is not only to place the implants, but also to enhance the attached gingiva on the spot. 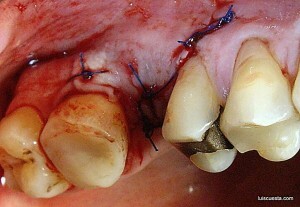 This means a partial thickness epithelial flap -leaving the periosteum on the bone-, displacing the flap buccally (to the side) and apically (downwards), and open healing. 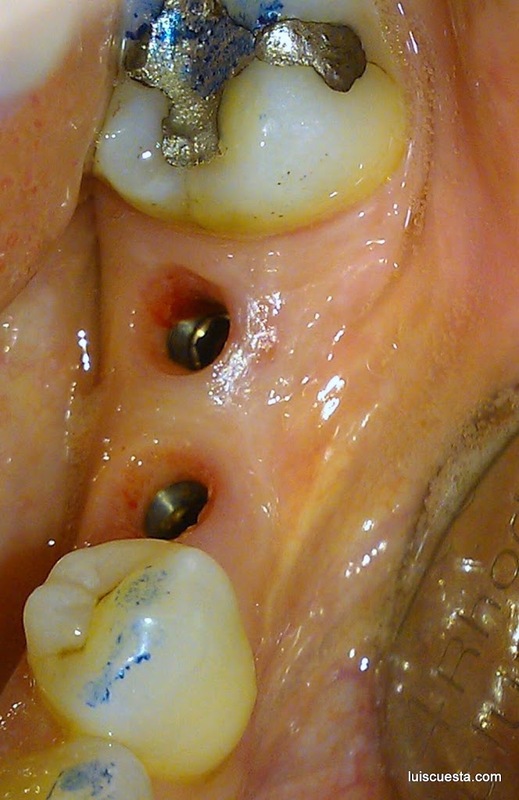 Contrary to a normal implant surgery, where the upper incision is done right on the ridge, in this case we want to displace as much keratinized epithelium from the lingual side and fix it bucally. 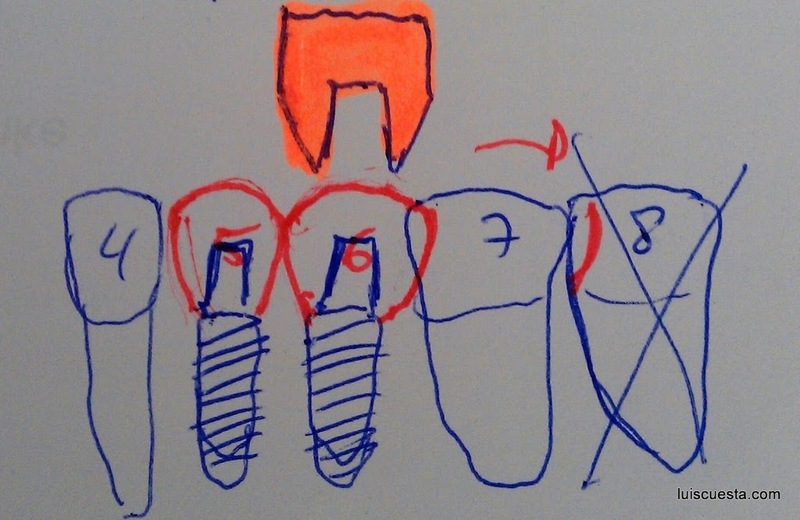 we need also two vertical discharges along which the flap will be moved. 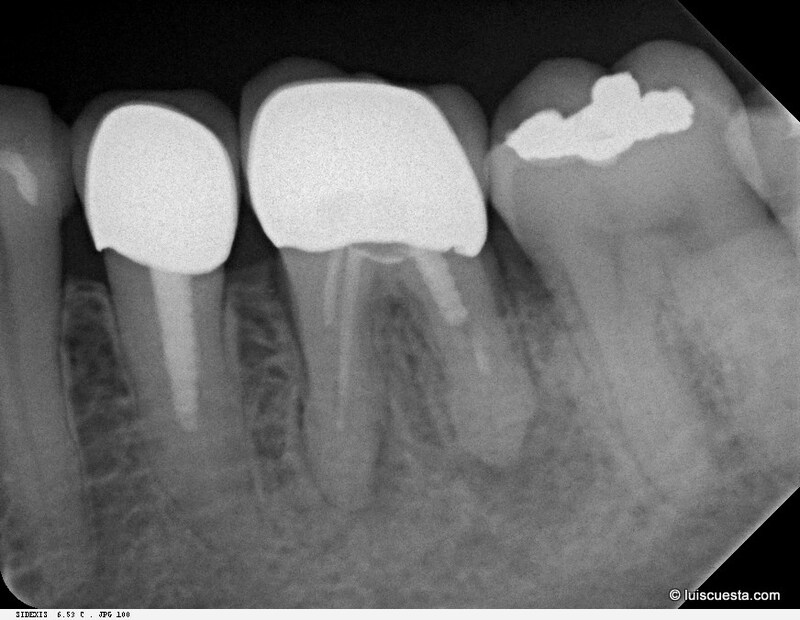 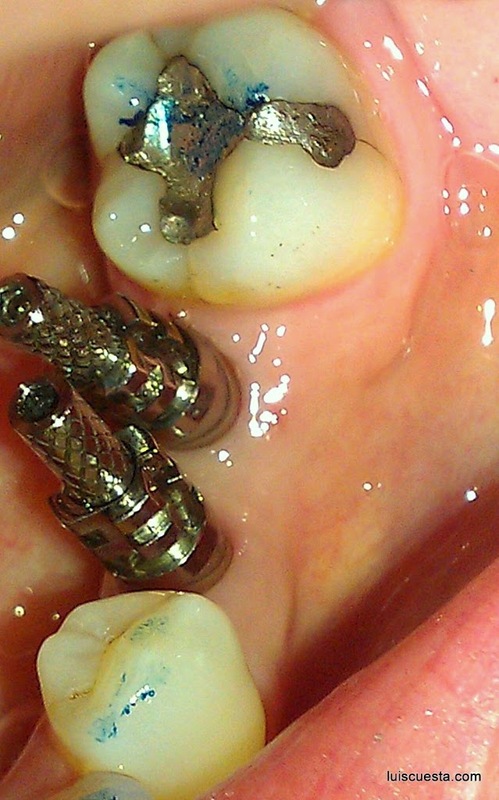 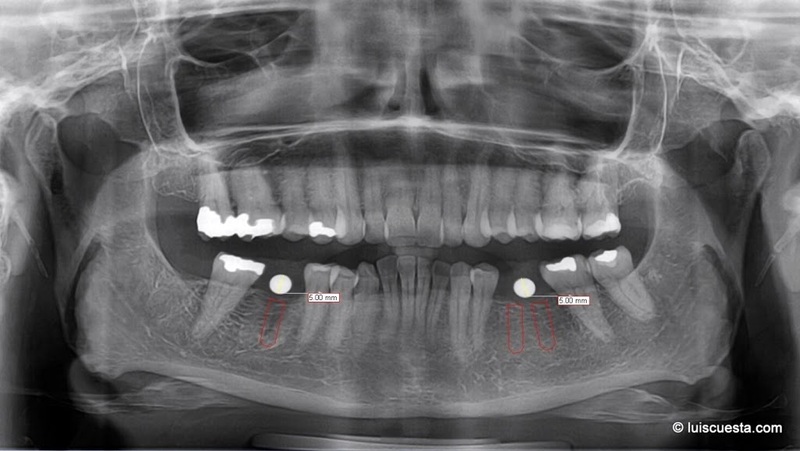 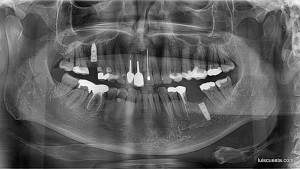 The implants are place at bone ridge level and, due to the periosteum thickness, they appear to be more submerged. 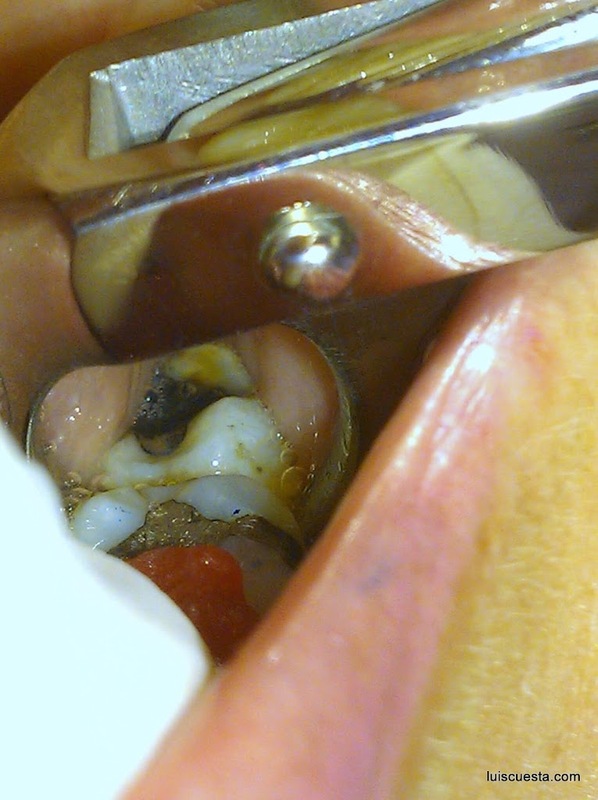 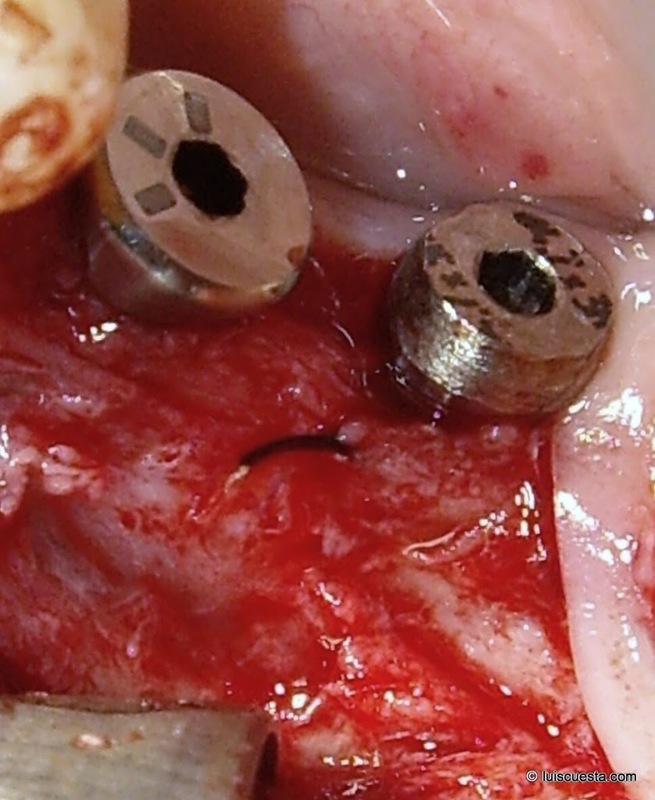 Now it is time to screw the healing abutments (3″ hight in this case) and to reposition the flap bucally with 6/0 Prolene stitches on the periosteum. 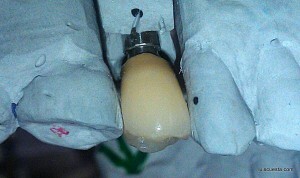 The gum tissue needs now quite a few week to re-epithelize the area, while the implants complete the osseointegration phase. The stitches can be removed one or two weeks after the surgery, but in this it was done 4 weeks later, because the patient leaves a few hours away from the office and cannot come so easily. 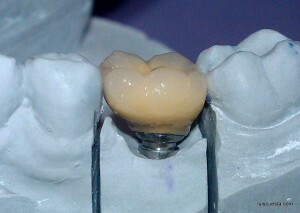 I try to adapt the appointments to other work stages on the right side, ceramic inlays and other conservative general dentistry therapies. 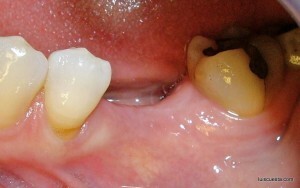 At this stage an enhancement of the attached gingiva can already be seen buccally. 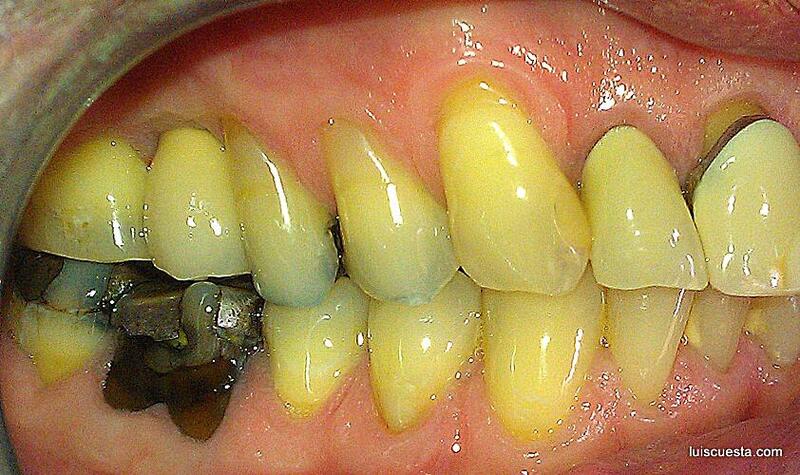 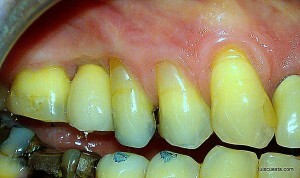 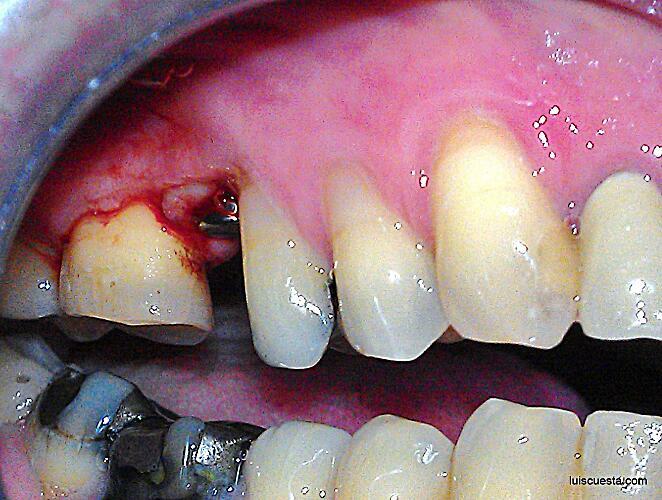 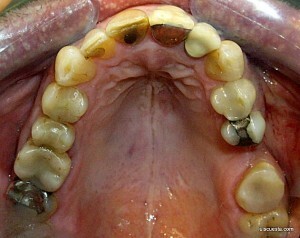 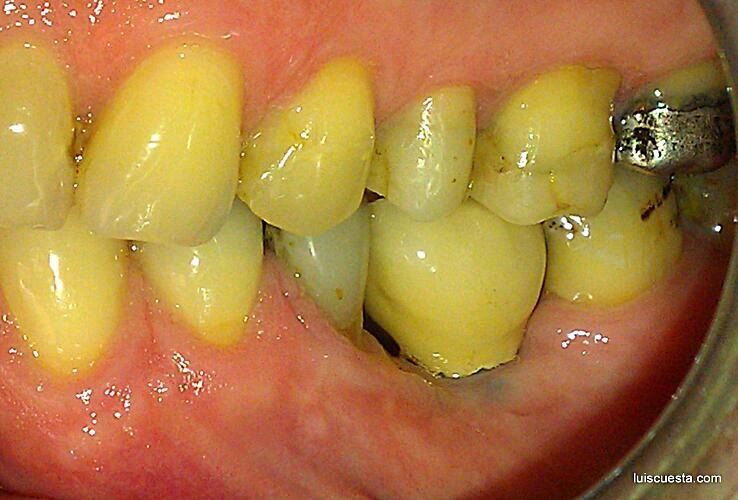 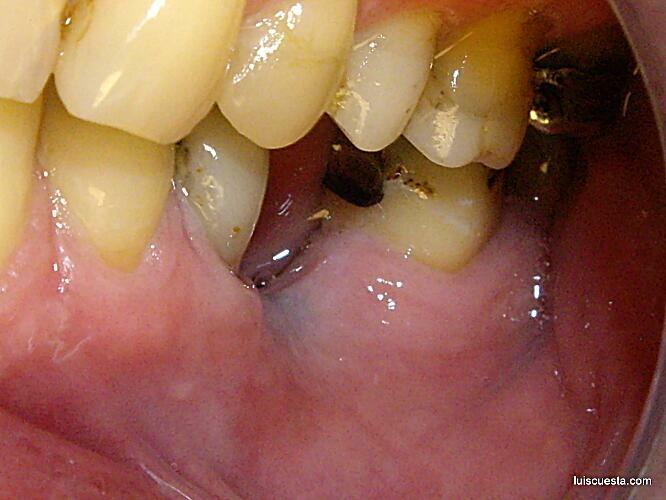 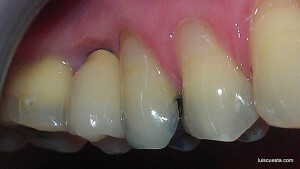 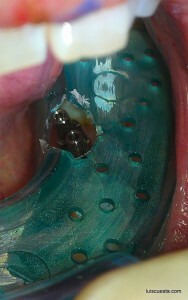 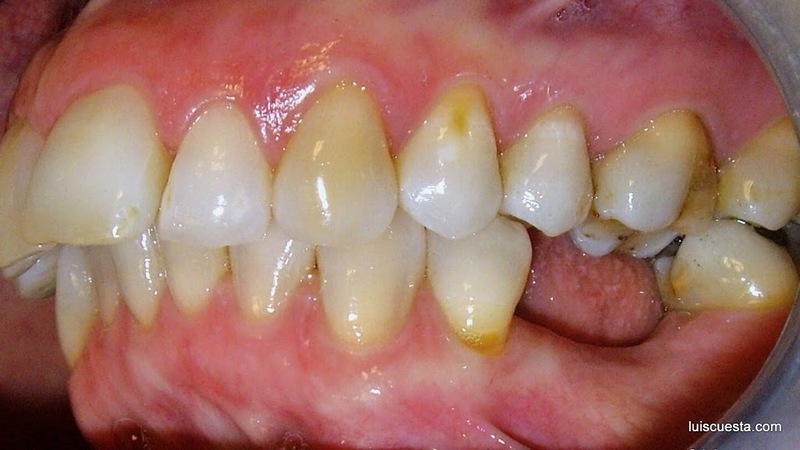 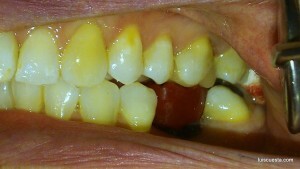 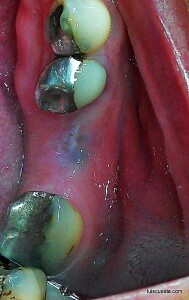 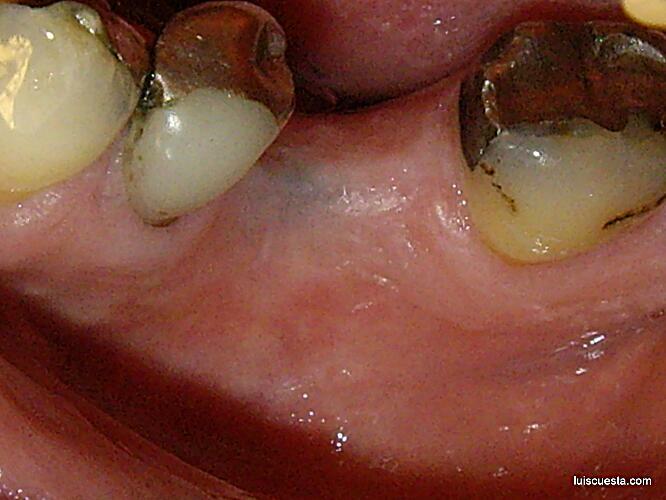 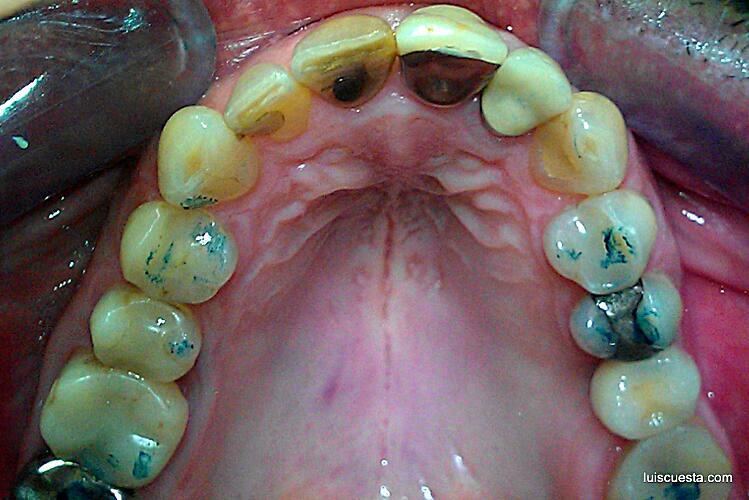 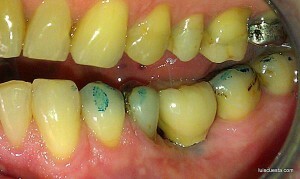 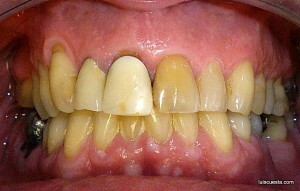 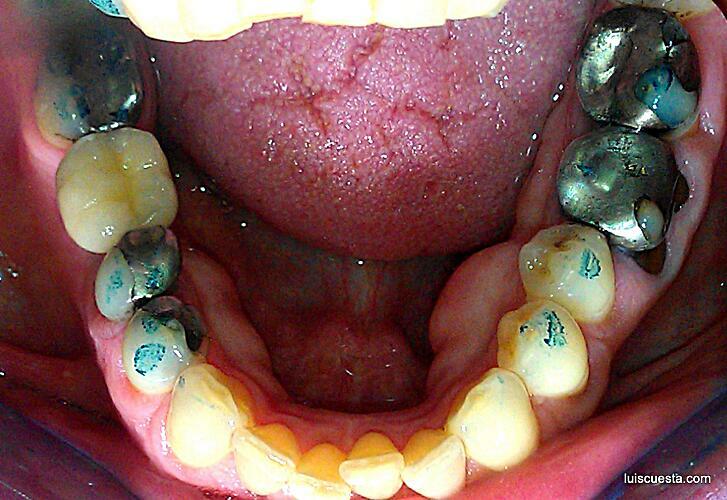 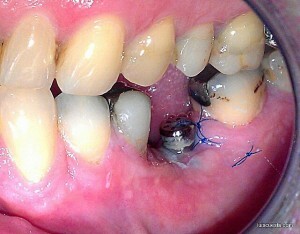 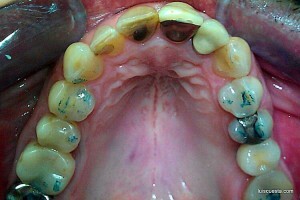 This is the resulting state of the attached gingiva after the healing phase. 14 weeks in this case, but it could have done by the 8th week or even earlier. 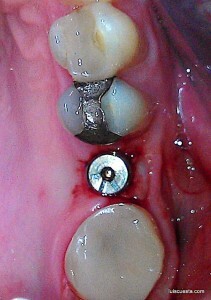 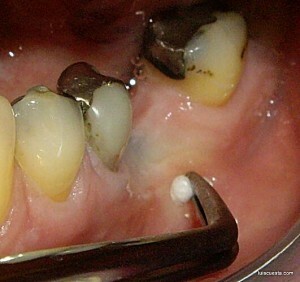 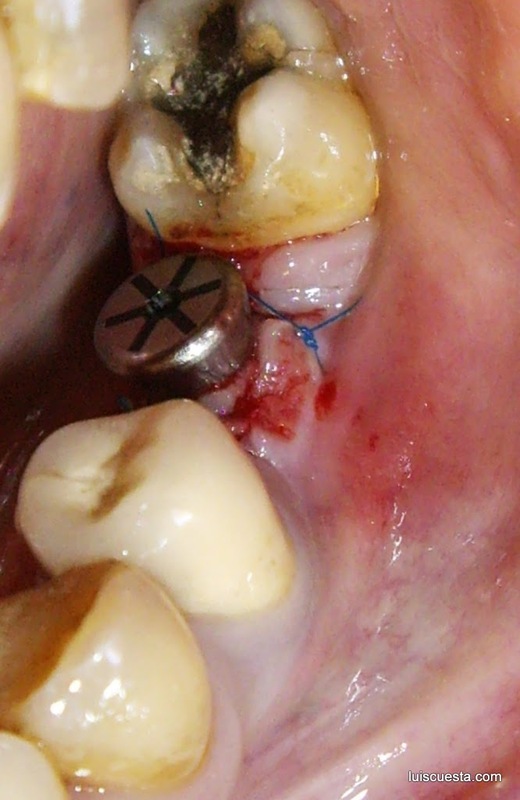 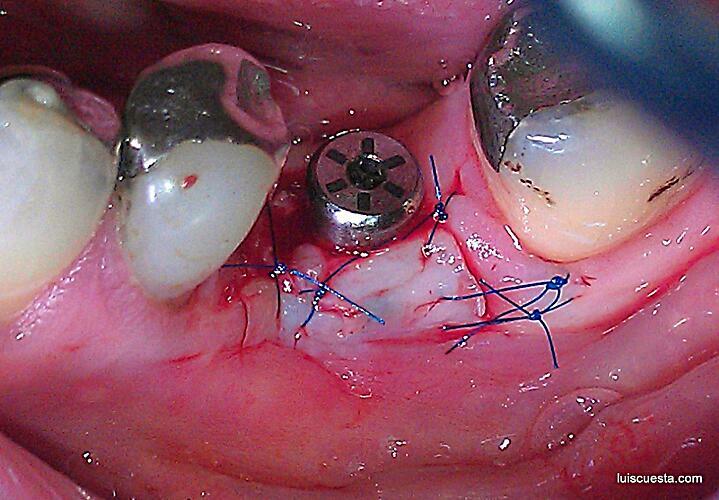 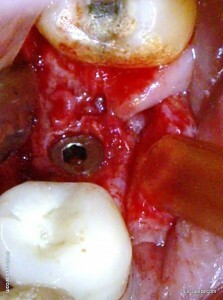 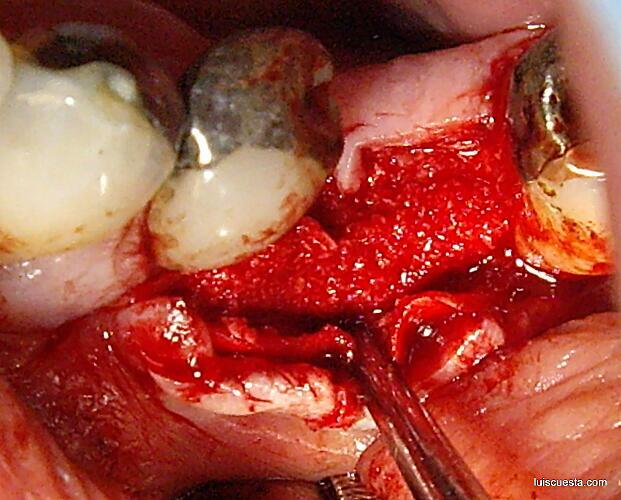 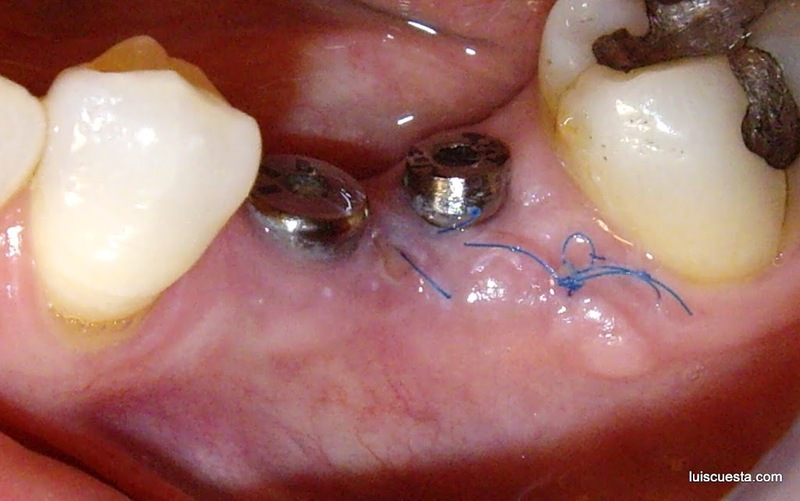 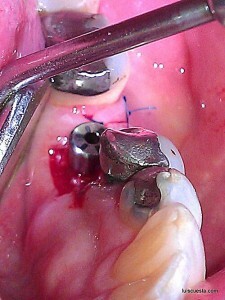 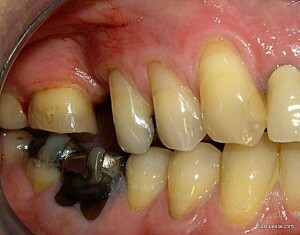 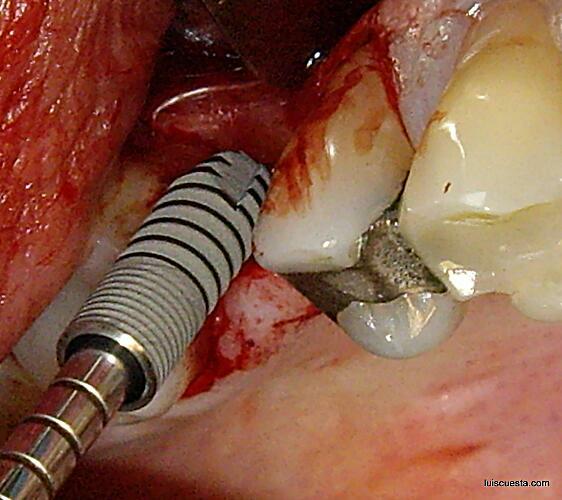 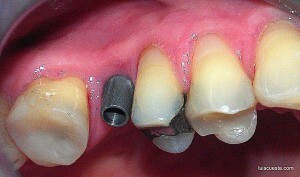 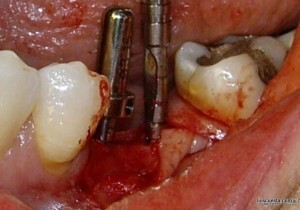 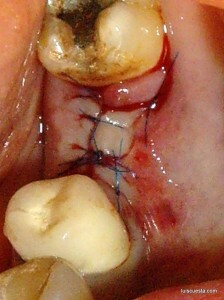 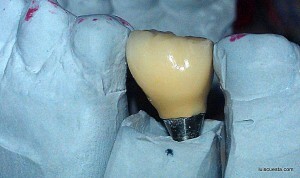 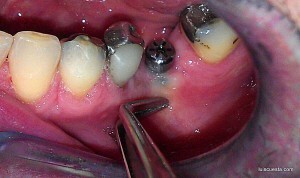 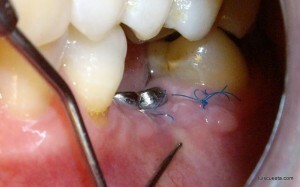 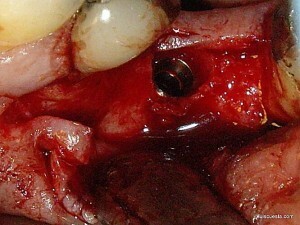 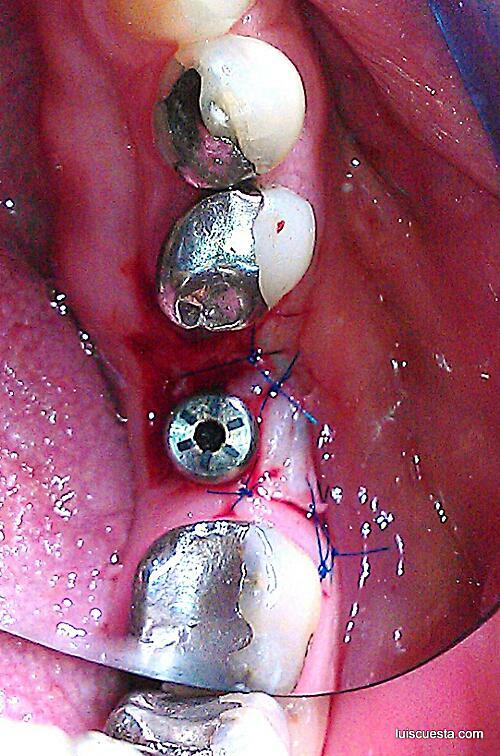 The benefit os this first surgery technique is that it needs dental implant exposure surgery at this second stage. The result is a new thicker keratinized attached gingival band around the dental implant necks. 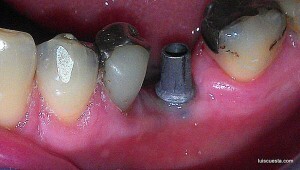 Two impression abutments are fixed on the implants and the plastic tray is perforated conveniently to let the abutments thorugh. 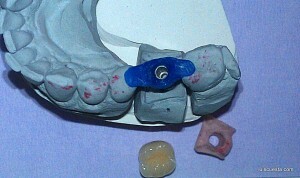 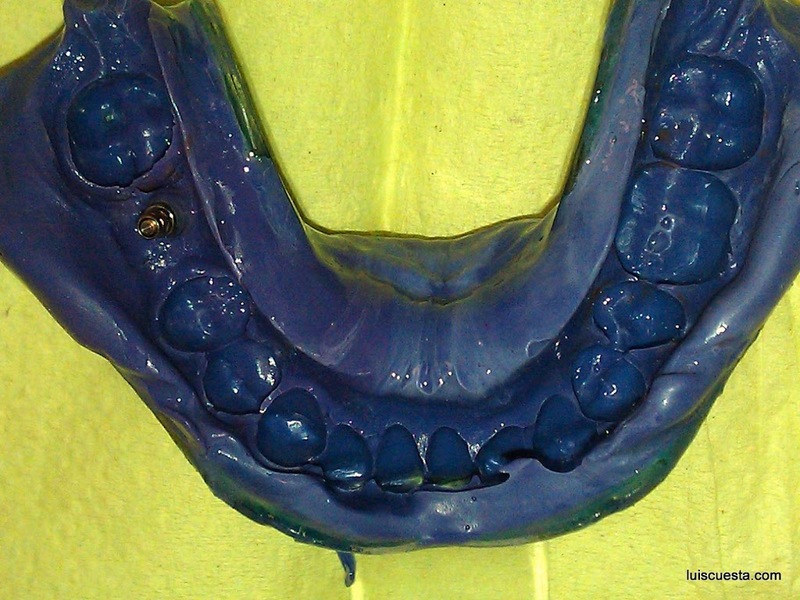 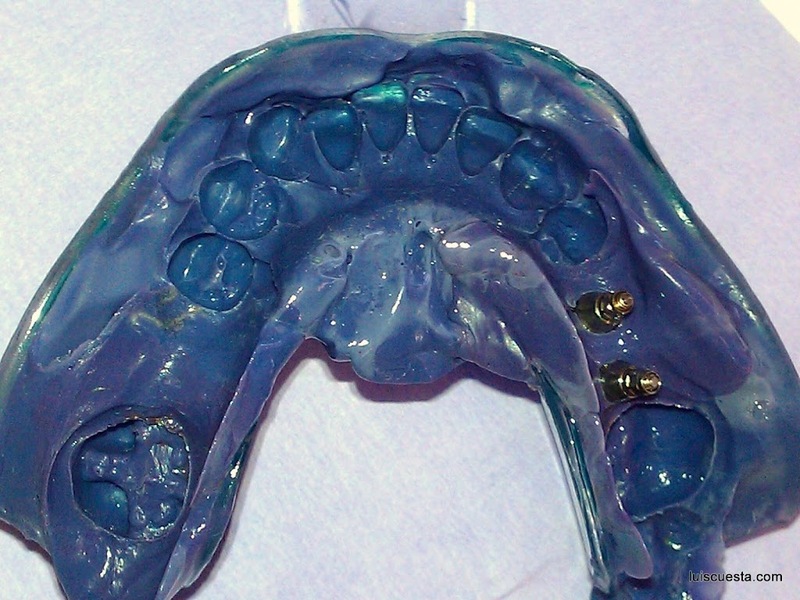 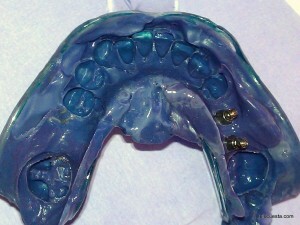 The impression is taken with Impregum, polyether material. 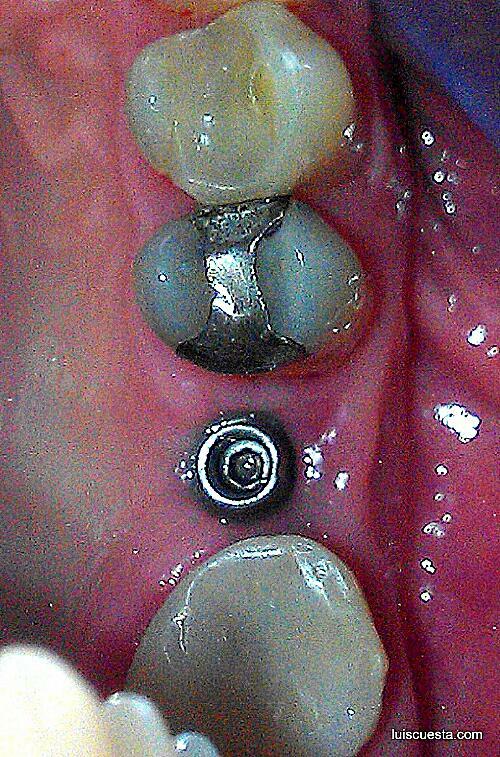 In the next post I will explain how I corrected the mesial inclination of the second molar and placed a wider crown on the 36 implant. 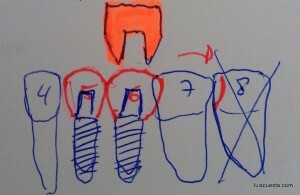 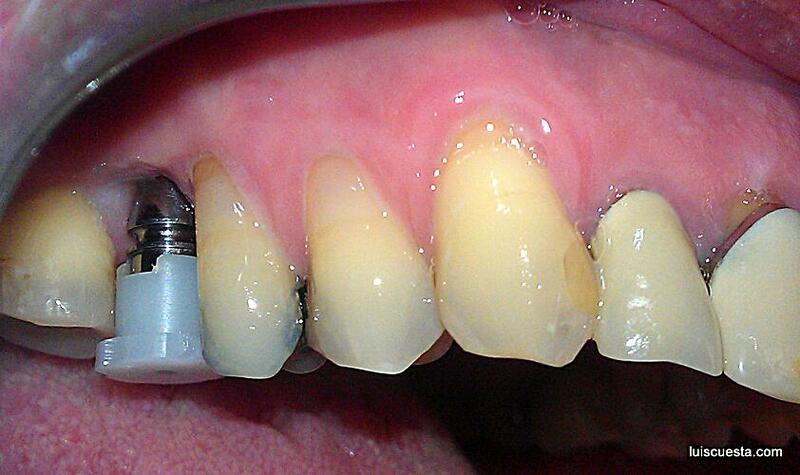 The width of the buccal wall of a dental implant is becoming more and more important for its long term durability. 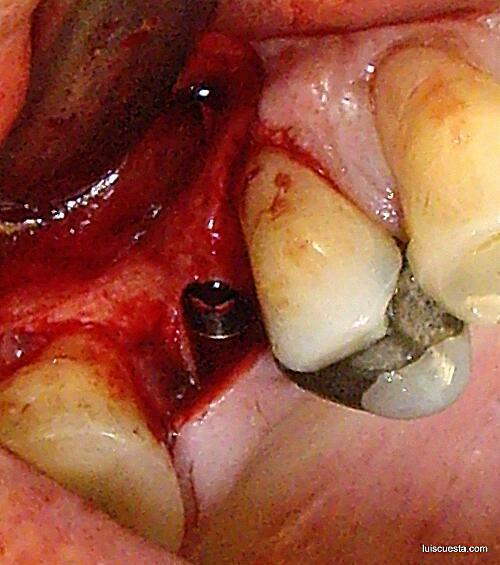 Placing the dental implant with 1,5 to 2 milimeters away from the buccal wall provides the bone wall with enough blood supply. 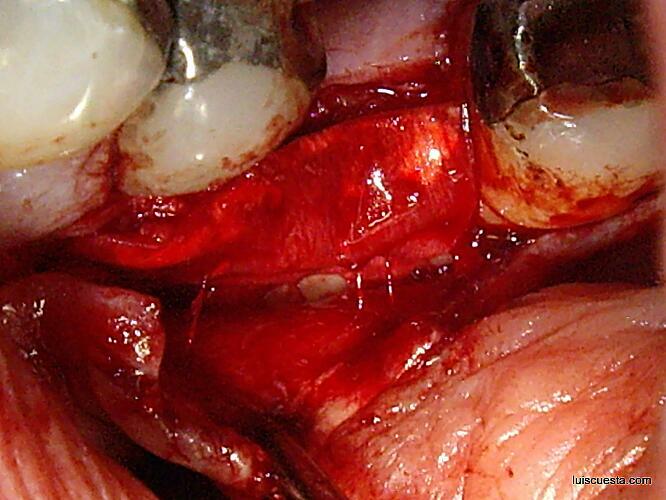 Opposite to teeth, whose surrounding bone receives plenty of blood support from the periodontal ligament, the implant have no ligament and no surrounding blood circulation. 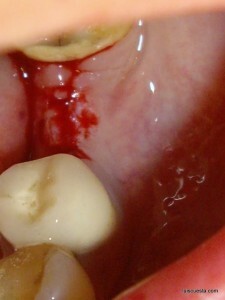 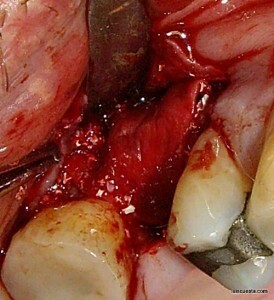 Thus the buccal wall blood support comes only from the periosteum and the transeptal blood vessels. 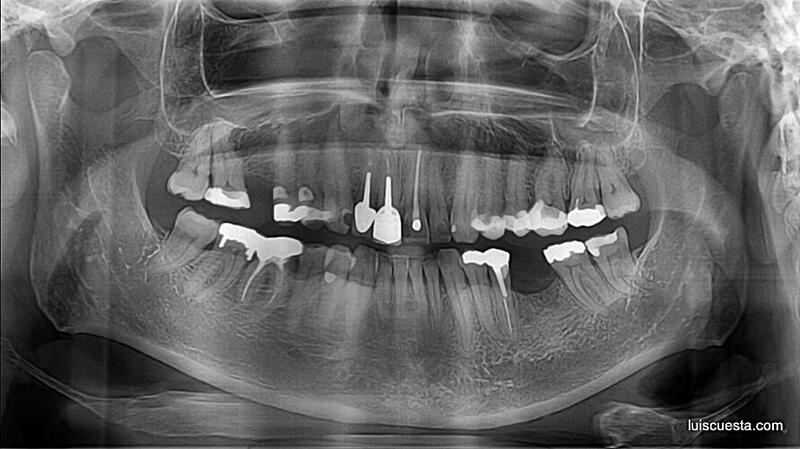 Providing the buccal bone wall with a good thickness allows the internal bone blood vessels to supply nutrients to the buccal bone. 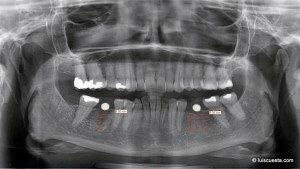 The X-ray shows two edentulous spaces on a 60 year-old man, non-smoker. 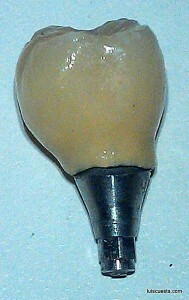 Thick biotype. 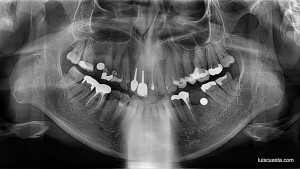 as well as a2D X-ray measurement with 5″ balls. 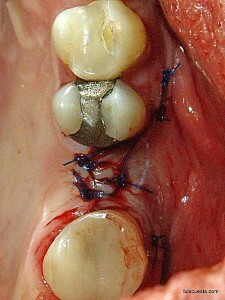 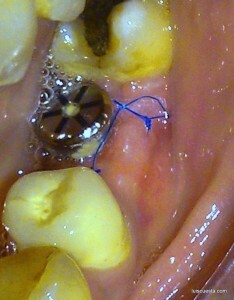 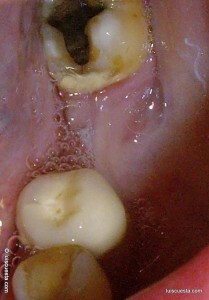 Regular split flap with two vertical discharges mesial and distal of the spot. 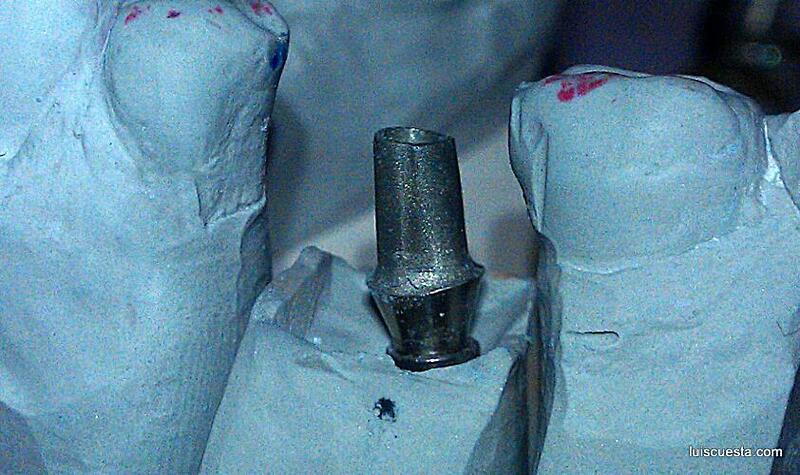 Bone condensing carried out to finally place a 3,75×12,5″ ICX-Templant (internal hexagon) insertion after bone spreading. The implant is placed 1mm under the bone level. 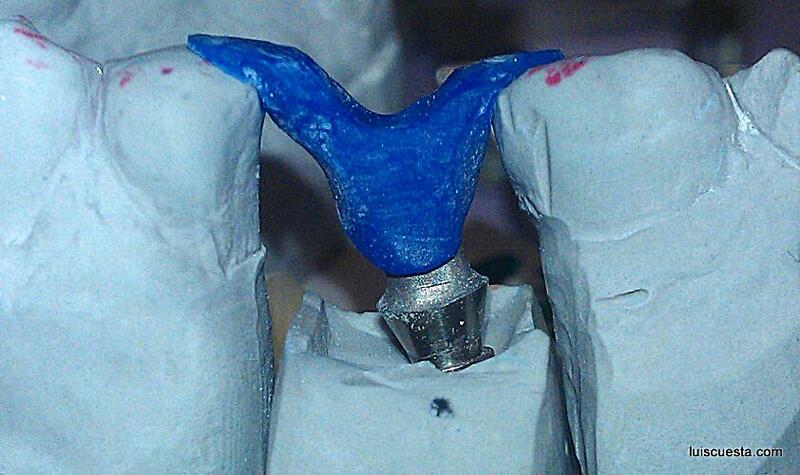 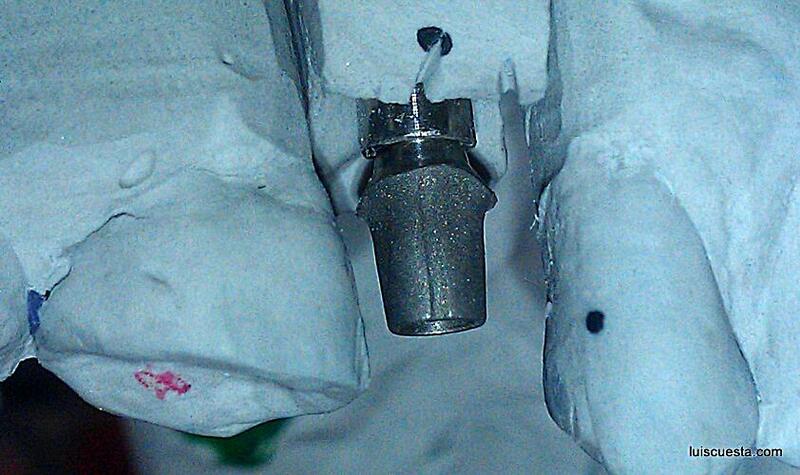 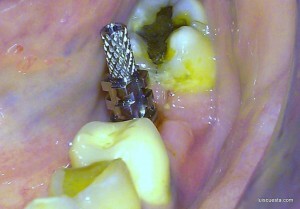 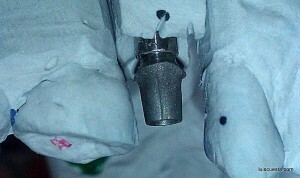 This allows some typical crestal bone resorption while still keeping the internal cone properties of the implant. 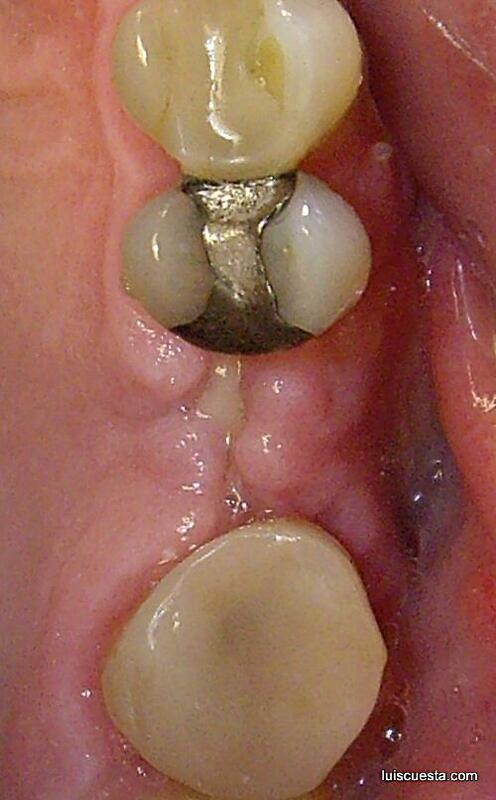 Notice the concavity of the buccal wall under the ridge level. 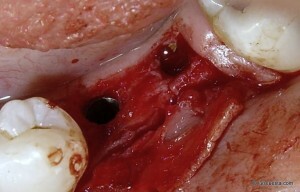 Bio-Oss and Bio-Guide GBR material protecting the buccal bone wall. This increases the initial volume and adds extra hard tissue substance to the buccal wall. 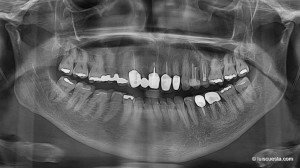 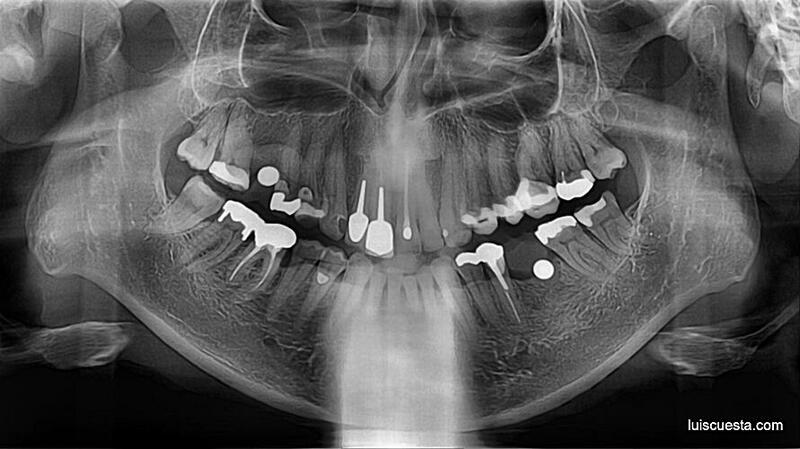 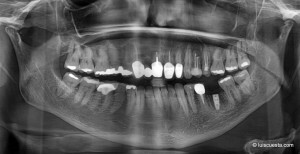 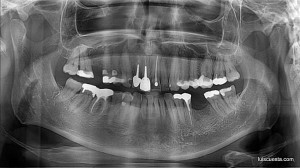 Panoramic post-operatory X-ray, after placing two 3,75×12,5″ ICX-Templant internal hexagon dental implants. 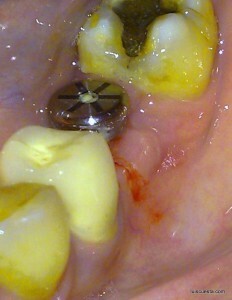 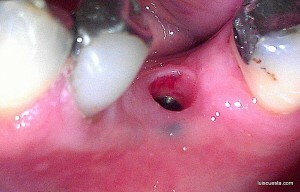 3 weeks after the exposure surgery, with the healing abutment. 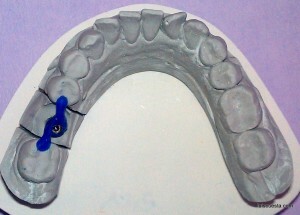 Impression transfer for a closed tray. 3,75×12,5″ ICX-Templant (internal hexagon) abutment emerging. 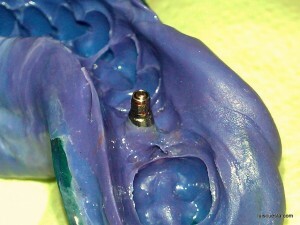 Screwed at 30Ncm torque. as well as a2D X-ray measurement with 5″ diameter balls. 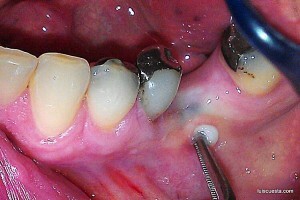 Regular split flap with only one vertical discharge mesial of the spot. 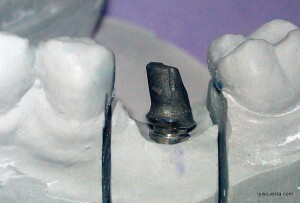 The 3,75×12,5″ ICX-Templant (internal hexagon) dental implant is placed 1mm under the bone level. This allows some typical crestal bone resorption while still keeping the internal cone properties of the implant. 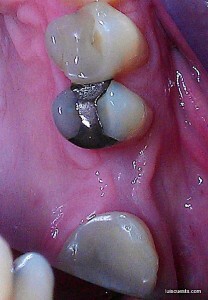 Notice the concavity of the buccal wall under the ridge level. 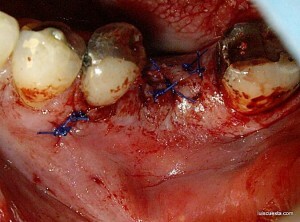 Suture of the flap with 4/0 Prolene. 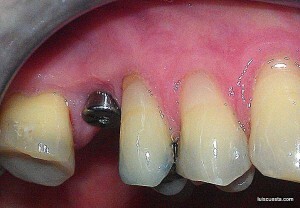 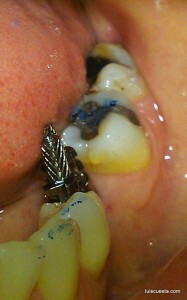 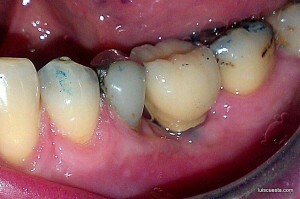 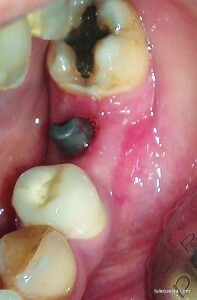 Soft tissue 6 weeks after the implant exposure surgery. 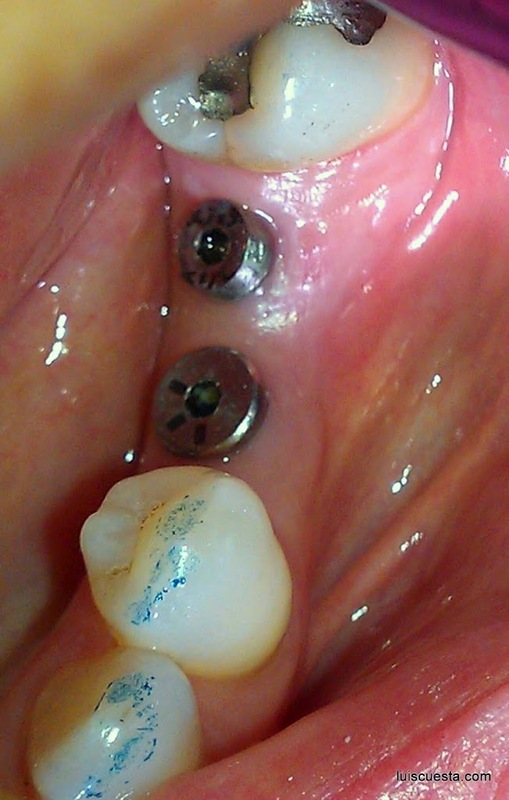 6″ healing abutment. 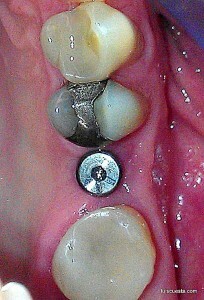 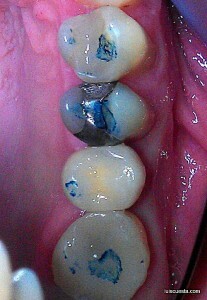 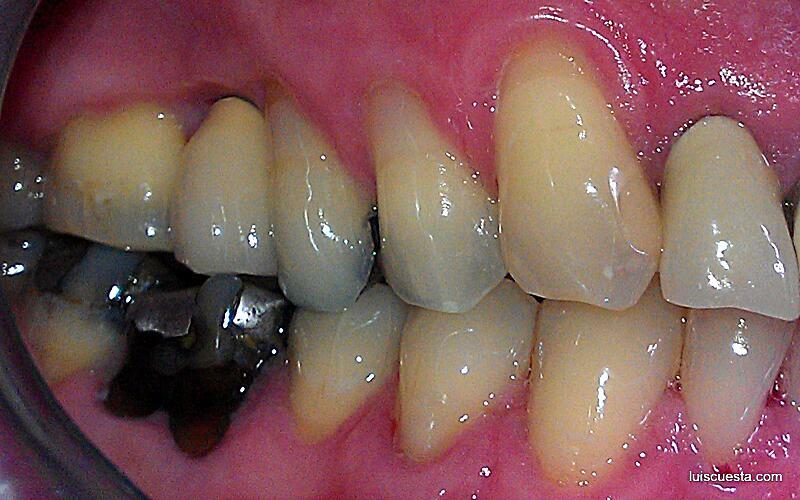 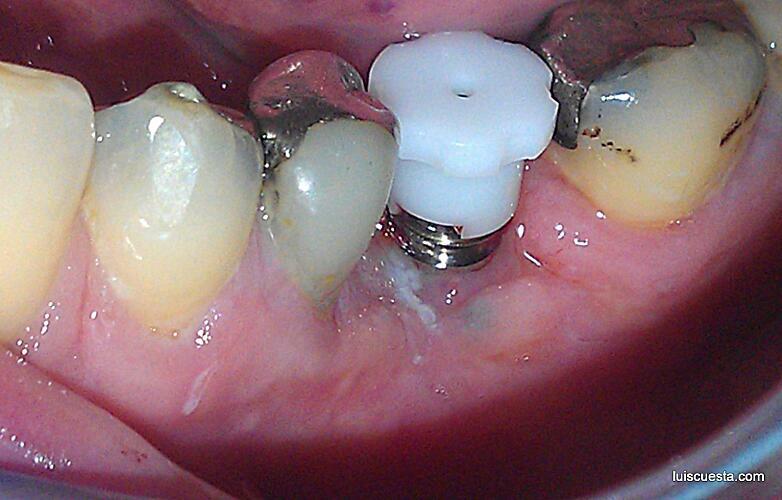 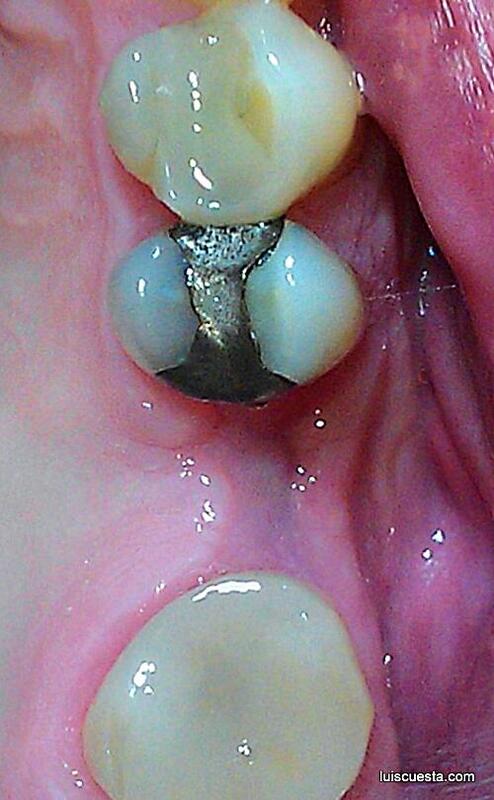 Soft tissue 12 weeks after the implant exposure surgery, 6 weeks after crown placement.